MA Leading Social Change is a part-time 2 year course equipping students to lead complex social change in an age of increasing complexity and disruption. This programme draws on the experience of people who are securing change in communities through collaborative methods and relationships. It is aimed at leaders from both community and citizen leadership backgrounds, as well as professionals. 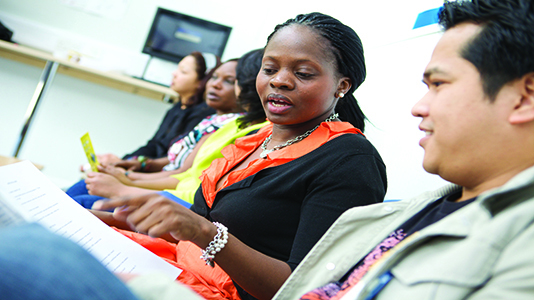 Degree course in Learning Disability Nursing; approved by the Nursing and Midwifery Council (NMC). Affiliated with world-renowned hospitals and Trusts in London and the South East. Degree course in Mental Health Nursing. Approved by the Nursing and Midwifery Council (NMC); the first step to becoming a registered mental health nurse. Affiliated with world-renowned teaching hospitals and Trusts in London and the South East. Part-time Postgraduate Certificate (PgCert), Diploma (PgDip) or Masters (MSc) course in Perinatal Mental Health; aimed at those looking to increase knowledge and skills in relation to complex and challenging issues within perinatal mental health. Postgraduate Diploma (PgDip) or in Learning Disability Nursing; the first step to becoming a registered learning disability nurse. Approved by the Nursing and Midwifery Council (NMC). Placements at world-renowned Trusts. Intensive route for first degree graduates into mental health nursing. Approved by the Nursing and Midwifery Council (NMC). Top-up to Masters-level.